Facebook updated its general layout ages ago – which is when we got the detestable timeline UI that we hate so much. What we didn’t understand at that time was that Facebook designed that UI because it would work better on tablets and smartphones. But after ages Facebook is finally updating its apps to show the timeline on Windows 8 smartphones. Well, better late than never, right? The Facebook app will boast of a renewed news feed, nearby places for checking in, tagging both places, events and friends. It will also offer 3 shortcuts which are there for posting you status, posting a photo and checking in on others. You can also subscribe to other people’s feeds and pages easily. 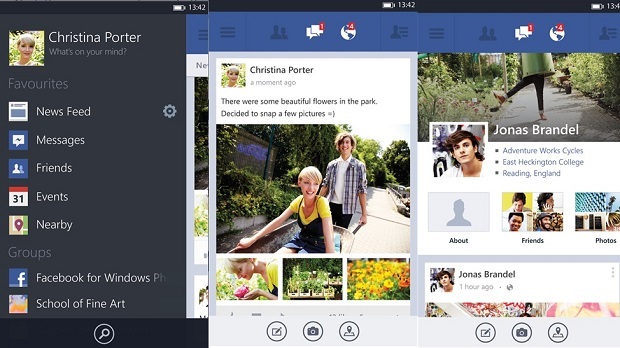 The Facebook Windows 8 app will look like it looks on a PC. It will also offer high—res photos, along with improved sharing and tagging. But, sadly, Windows will only have this update for the esteemed users of its Windows Phone 8 interface and not for Windows Phone 7 and Windows Phone 7.5 users. We see as the cardinal sin of Operating systems – they forget their old system while reaching out for updates. While Android has tried to rectify this with the coming version of its platform – the Key Lime OS, Windows is taking a step back by not providing timely updates and not stressing enough on app developers to do so. Still, just for consolation, Microsoft has kind of promised that it will update the Windows 7 app in due time. For developing the app Microsoft put out a beta version called the ‘Facebook 5.0’ out in the Windows store and then used the feedback to improve on it. Meanwhile, we still think there is a lack of good apps when it comes to Windows 8.